The challenge at Sweet Stamps for this week is Christmas Greenery. 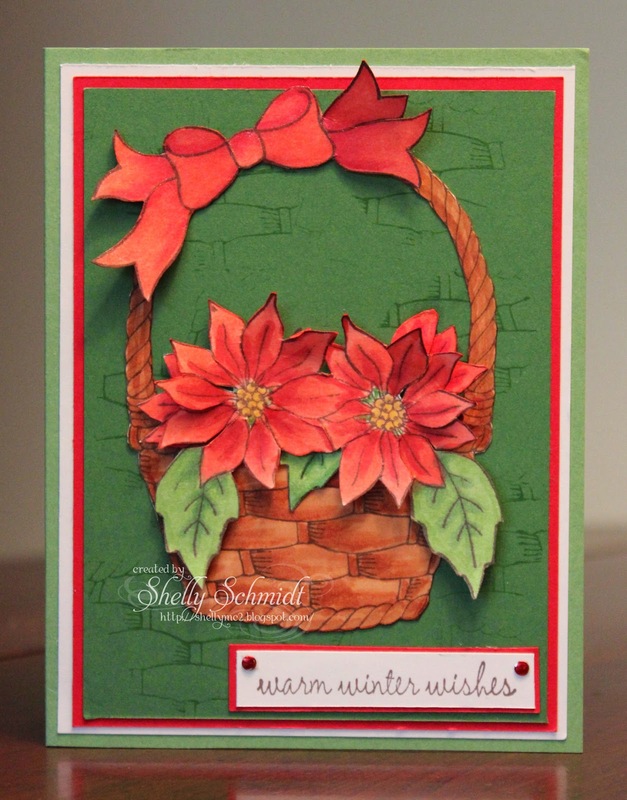 I created a card for this challenge by using a portion of an image-using the Poinsettia's- from the Poinsettia Candles and the image Jackie's Basket and Bow duo. I used the basket to add a little depth to the green cardstock for the background. I stamped them using a Shades Spot and colored them with Copics. I am on the road- and have supplies with me to create- and I forgot the black ink I generally use with Copics. I was thrilled the waterproof Shades Spot worked beautifully with no running for me! I fussy cut the flowers, sniped into the leaves of the flowers for dimension and added Wink of Stella to the centers of the flowers and on the edges of the bow. We have a weekly challenge and a monthly technique challenge. The monthly challenge 7/15-8/14 is Parchment Crafting. Our winners are chosen by Random.org- and if you use a Sweet Stamps image, your entry will count x's 2! The challenge for the next two weeks at Card Mania is Vacation/travel. I am joining the team for the challenge as a Guest Designer. The challenge Sponsor is Simply B stamps. I chose Water Balloon London for my card. There is nothing better to me than heading to the beach on a lazy day! To add to the fun- a water balloon fight- and where I am from, we put them in a cooler for the added shock of cold water when you get hit by one! The image is colored with Copic Markers. 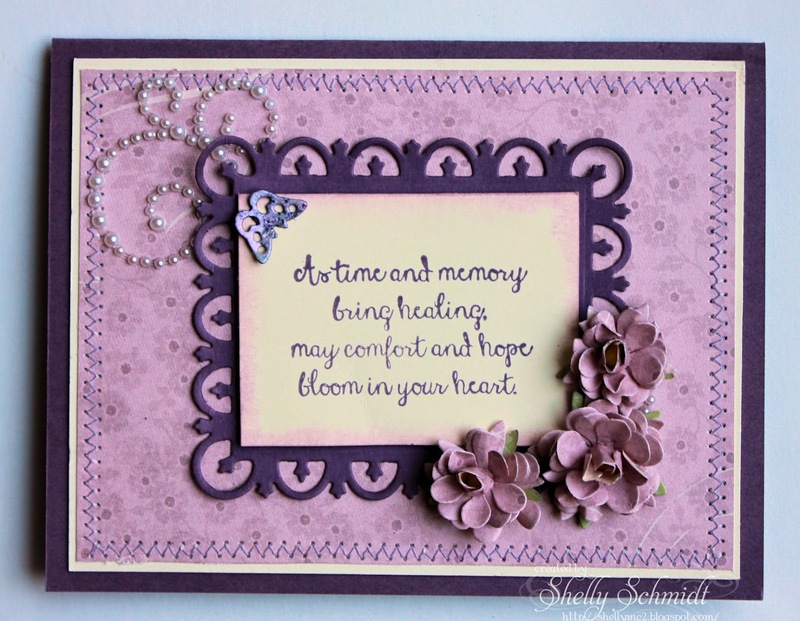 I used DP I found at a discount store in a scrapbook pack- a few years ago.... and I used Sentiments from Create with TLC. 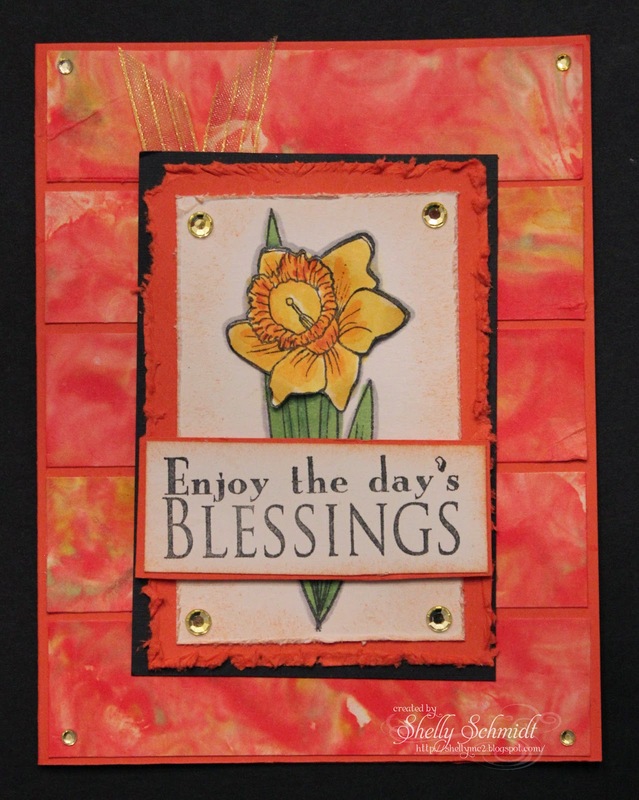 The main panel die and tag die are both from Cheery Lynn Designs. The Technique Junkies June/July newsletter gave us one more thing to do with our Inka paints- called Inka Gold Stamping. Images all Mark's Finest Papers. I always like to try new and different things, so for the tag challenge at Sweet Stamps, I took out a stencil and lite modeling paste, and here is the tag I created! I was so thrilled to see stencils in the Sweet Stamps store! I used distress inks dabbed onto the craft mat, spritzed with water and dipped the tag into it one color at a time. I dried the tag between each color with the heat gun. Next, I applied light modeling paste over the stencil to create the fun background on this tag. I sponged on Faded Jeans color over the modeling paste. I added a couple of SweetCuts dies and snowflakes from Globecraft and Piccolo using Turquoise Lagoon Enamel embossing powder. I wanted to point out- the enamel adhesive has a dauber top- so you can sponge it around the edge of your project, dip the edges of your card/tag/chipboard...etc in the powder and it will stick and you can emboss the edges for a special finishing look. I used seam binding to finish the top of the tag. I tapped the ink onto the craft mat, spritzed it with water and put the ribbon in the wet ink. 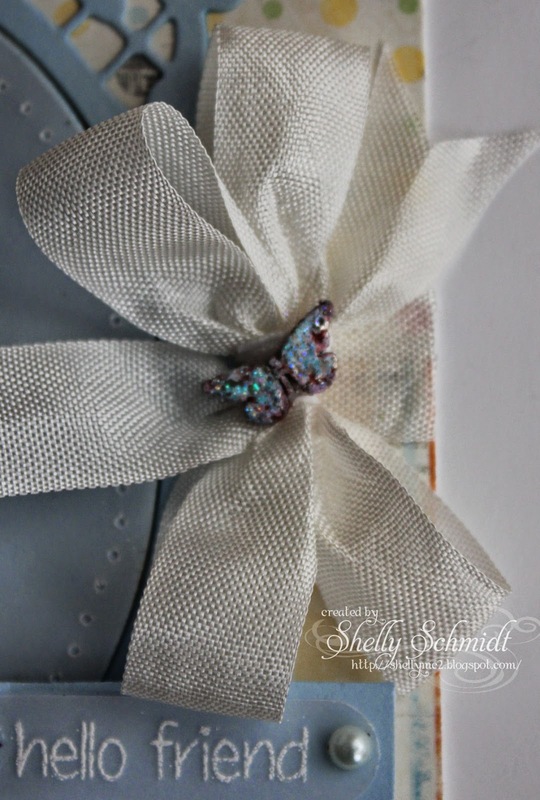 Perfect color on the ribbon to match the colors in the tag! We are making handmade flowers this week at Tuesday Throwdown. I used a SU sentiment and SU (retired) DSP .The cardstock is Vanilla and Perfect Plum, and the ink is also Perfect Plum. 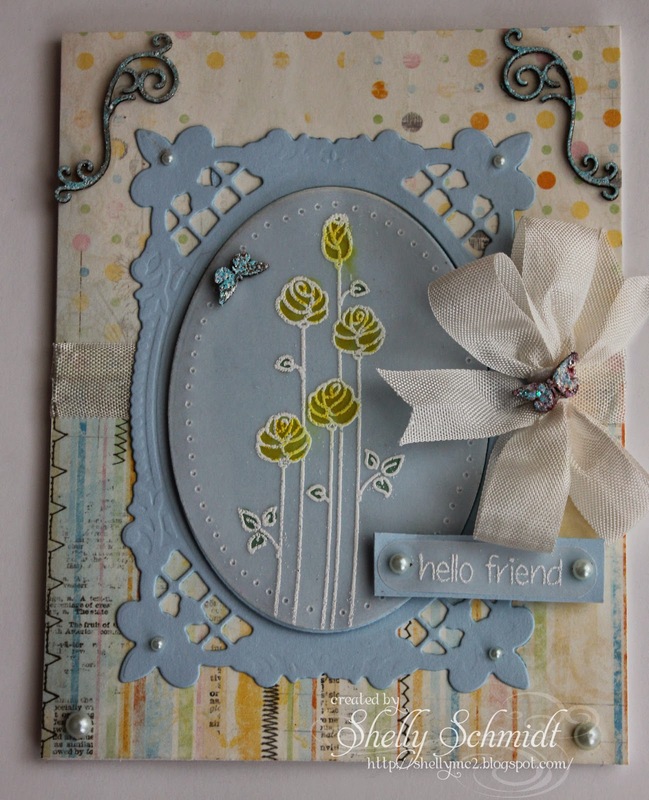 I used 2 dies from Cheery Lynn Designs- Small and Med roses- I think it is the first time I have used them! I cut the flowers out of the DSP. The butterfly is also a Cheery Lynn die and it is cut out of a shimmery Technique Junkies scrap. Anyway, I have always been creative- rubber stamping is just the latest obsession- for 10 or so years now. I joined the Technique Junkies in 2004, and really 'grew up' with techniques being the driving force for my obsession...! I have no formal art training. In fact, I had Prismacolor pencils- a big set for about 6 years before I knew why there are so many gray pencils in it. I have really learned so much in 10 years! I usually only make ONE of each card- every now and then, I will make two......and I am very slow...rather S-L-O-W at stamping and creating. Although, it is faster than smocking and sewing dresses...so I have stepped up the pace over the years. I have made 2 scrapbooks in the past, but enjoy the immediate gratification of a card that is completed over layouts that take me a day or two to finish one.... (Although I have a trip or two to scrapbook). Most of my projects are done with Copic markers and occasionally Prismacolor pencils. I also enjoy Parchment crafting, but do not do that as often as I would like to. I started my blog a few years ago when I saw a DT call- I decided it would be a great way to stamp more regularly. I love meeting people from all over the world- as we do in blogland! I have to say, I am visually inspired, so do a little blog hopping (mostly at night) and view some Pintrest for MoJo. I love challenges as well. I belong to a couple of fabulous blogging groups- and highly recommend it to others : ) I joined through the Blogging forum at Splitcoaststampers. One is a group of ladies from all over - mostly the USA, who chat and design cards and inspire and support each other. The other, is a group that chats and posts inspirational cards with Christian themes, and we have a post once a month with a theme. I also belong to a couple of busy Yahoo groups- one is Oriental Stamp Art- where the Inspiration and talent is really a 14 on a 1-10 scale! The OSA group has tons of swaps and mingles as well. The other Yahoo group is the Technique Junkies. Please feel free to scroll thru the pages here if you would like to see my creative process. I have been having a busy vacation- Katie is in from China, and Chris is here from Colorado: ) We were able to run up to Michigan and see Stephi- and it was the first time in two years we were all in the same place at the same time! I wanted to share a fun card I created with Distress Inks and the Technique Junkies newsletter- this is a fun technique- and I liked putting the colors together- like a puzzle. The stamps are from the Embossing Arts line at I Brake for Stamps. I am not a coffee drinker, but enjoy making cards with it for my coffee drinking friends and relatives. These fun stamps were just released last month and I was itching to ink them up! I used the antistatic pad over the Parchment vellum and used the Sweet Stamps White Dye ink and White embossing powder on the flowers. I colored with Copics on the back of the vellum, and it gave the flowers a greenish hue, so I colored them again on the front. I pierced around the edges of the vellum as well. I love the soft look of the Parchment vellum. The accent pieces are chipboard accents called *GLOBECRAFT & PICCOLO* by Sweetstamps.com, and I love how detailed they are and easy to emboss using the enamel embossing adhesive- and I love the fab embossing enamels- the colors are so pretty plus they are mixed in with a shimmery/glittery metallic- love the way they look! Dab the Enamel Embossing Powder Adhesive onto the swirls. After gently rolling the powder in the bottle, I pour it over the chipboard using a coffee filter. Can you see how sparkly it is??? I take a piece of the chipboard sheet that is unused after removing the shapes and make a sample and attach it to the top of each of the bottles- you can see this in my adhesive picture above. At Card Mania, the challenge for the next two weeks is "How Charming". The Sponsor for the challenge is Kenny K digi's. She is called Texting Diva. This is my first time using a Kenny K digital image. I have 2 twenty something year old daughters, so found this image quite sweet. She is colored with Copic Markers and layered on Bo Bunny papers- bright and summery : ) The sentiment is by Create with TLC digis. The die cut is a Cheery Lynn Designs die, the circle are 1" and 1 1/4" circle punches. The charms are really old- possibly from the Target dollar spot. The Charm is from Hobby Lobby- not sure who makes it. The Stamp Addicts Blogging group at SCS has a challenge (it was actually for June) to make a card using the shaving creme technique. I apparently added too much reinker- OR the Distress reinkers are very colorful compared the regular ones..... (I used Ranger Barn Red and Lemonade ). I used the Sketch Challenge at Mark's Finest Papers- and it has a twist- make a card for a friend- yep- sending this in the mail tomorrow! The image was colored with Copics, and I stamped the image twice and cut out the top layer so the flower would have some dimension, then I also distressed the edge of the Tangerine cardstock. 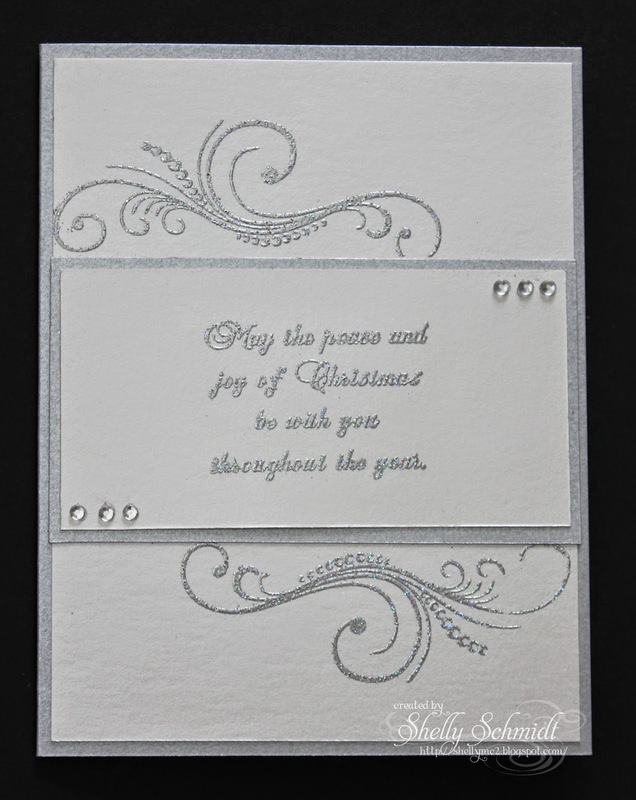 I started with a very shimmery cardstock in Silver and Ivory from Marco's paper called Stardream Cover. I swiped over it with the anti-static pouch, then embossed using Fantasy Silver Embossing Powder- it is very sparkly IRL! I stamped the sentiment and measured how much space I had remaining from the top and bottom of the card. I masked off below those areas, then embossed the flourishes. We have a weekly challenge and a monthly technique challenge. The monthly challenge 6/15-7/14 is Painters Tape. Our winners are chosen by Random.org- and if you use a Sweet Stamps image, your entry will count x's 2! Tuesday Throwdown- Lets Have a Picnic!